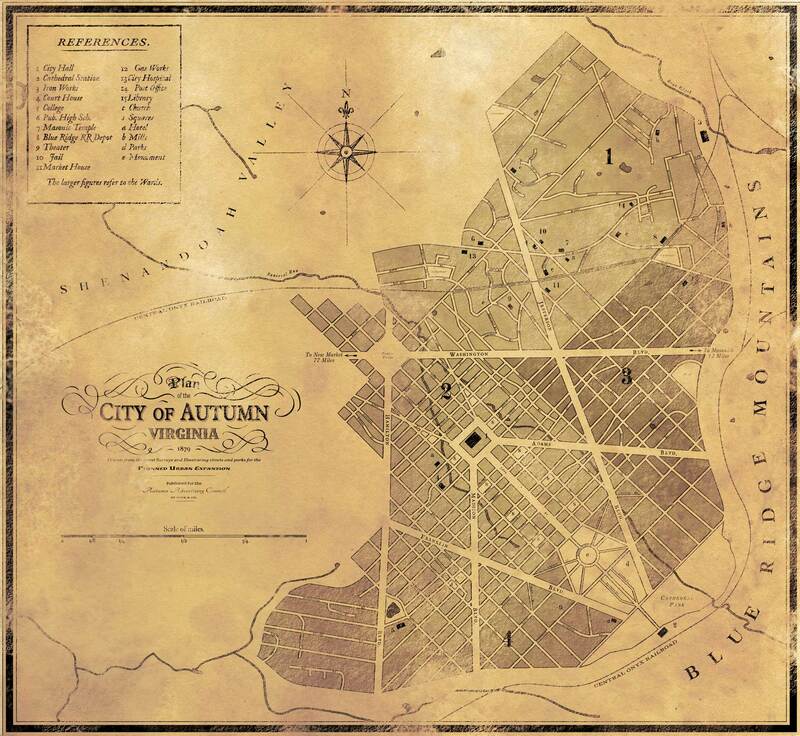 Prior to 1875, the city of Autumn was nothing more than a few sparsely laid out houses on one long dirt road. The village was founded in 1803 and remained mostly unchanged for over 70 years, until a bitter dispute changed all that. In the fall of 1875, Raymond Greenwell, the railroad tycoon, was blamed for a city wide fire in the town of Moosnick, just on the other side of the mountain. The conflagration had started near his newly purchased iron works factory and swept through the city, destroying a whole section of the city. The residents already despised him for his behavior towards them, and their rage was spurred on by the leading voice against him, the local newspaper, the Autumn Sentinel. Soon after meeting Mr. Wick, a new resident of Moosnick and civil engineer in charge of advertising new residential plots in the area, Raymond crossed the mountain divide and purchased many acres of land on the eastern side of the valley around the dirt roads. Soon after, construction began on two large projects, the railroad station and city hall. Look what I discovered while rummaging through old stacks at the Autumn Historical Society. 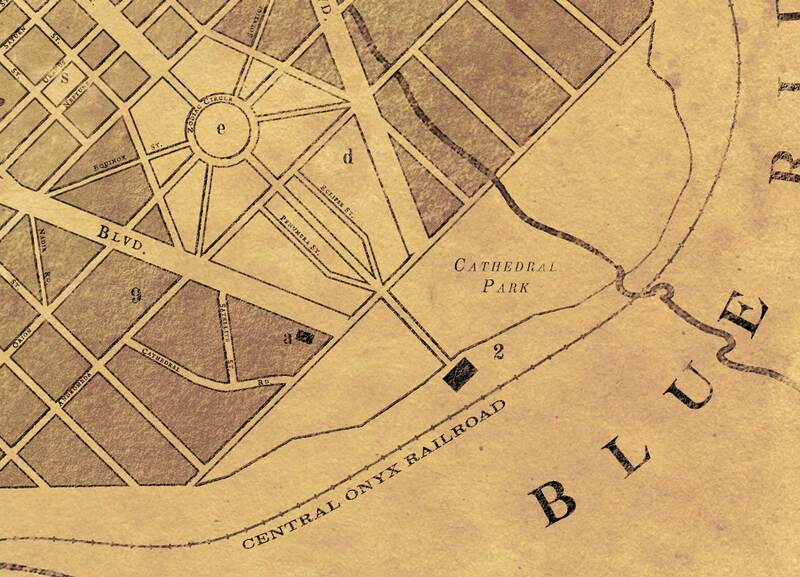 It’s the original 1879 plan of the city! 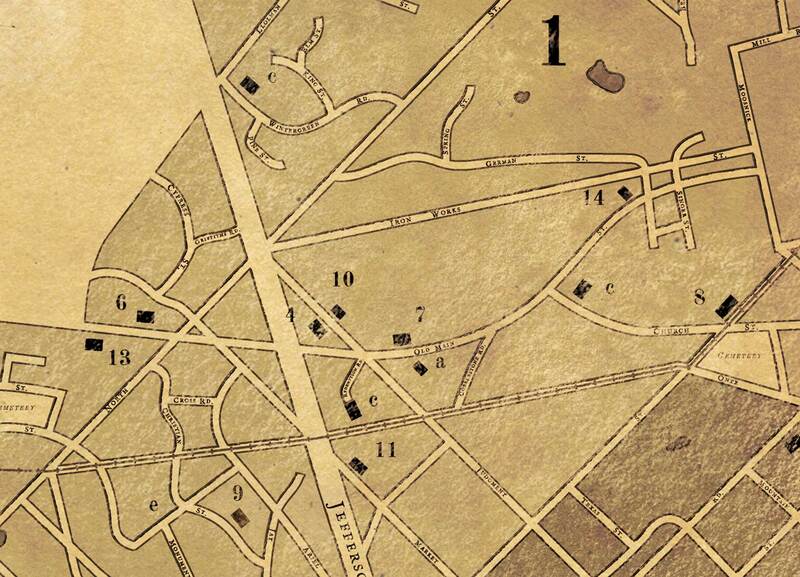 Also known as the Wick Plan, named for architect and engineer Harold Wick, this city grid was developed in a style similar to the L’Enfant Plan in DC with large boulevards criss crossing the city. I created this map in a vintage style using Illustrator CC for most of the work as well as Photoshop CC for final touches and aging effects. This plan is intended to be my own reference for building the rest of the city. I needed to put the locations I have in my head down on paper . Many early American cities follow an organic growth pattern because of the way streets were built around farms and cow paths. 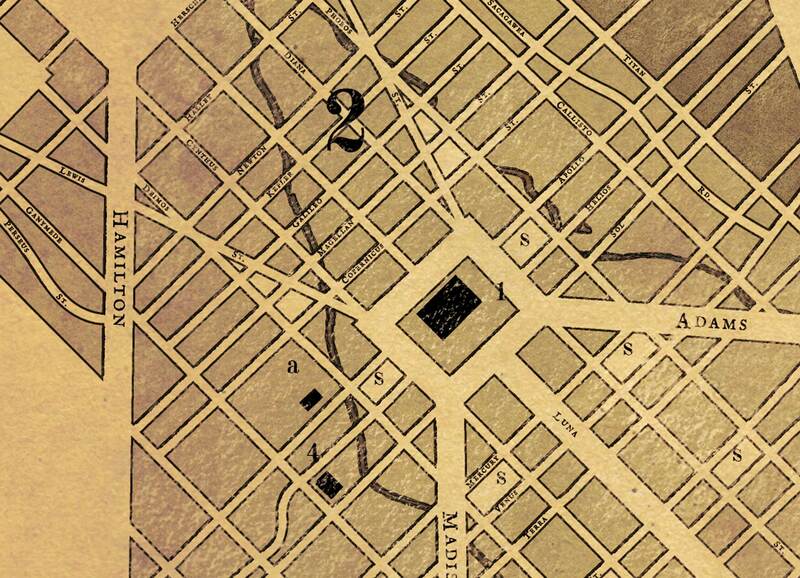 Cities in the 19th century, however, followed a strict grid pattern to match the planning philosophies of the day. I wanted my plan to fall somewhere in the middle. It had to fit in the context of the period but also allow for flexibility. I don’t want Autumn to grow like New York. Like all city plans, mine will be used as a guide which will probably change to meet the demands of the city. I discarded the standard numerical streets for something more fun and unique. It was a hard decision because most grid plans include numbers, trees, or something similar in their setup. I’ll let you take a closer look to see if you notice the theme. The region at the top is considered Old Main, the original section of the city with most of the buildings located along Old Main St. (previously just Main St.). The bottom half at the time of the map’s creation is still open land. I expect to create more maps in the future with various information like future expansion, neighborhoods, architectural drawings, etc. I really enjoyed researching old maps and working on this, and, at some point soon, I will have it in my shop for sale as a print. Back to the stacks for me to see what else I can find! Check out the post at patreon.com to become a patron! 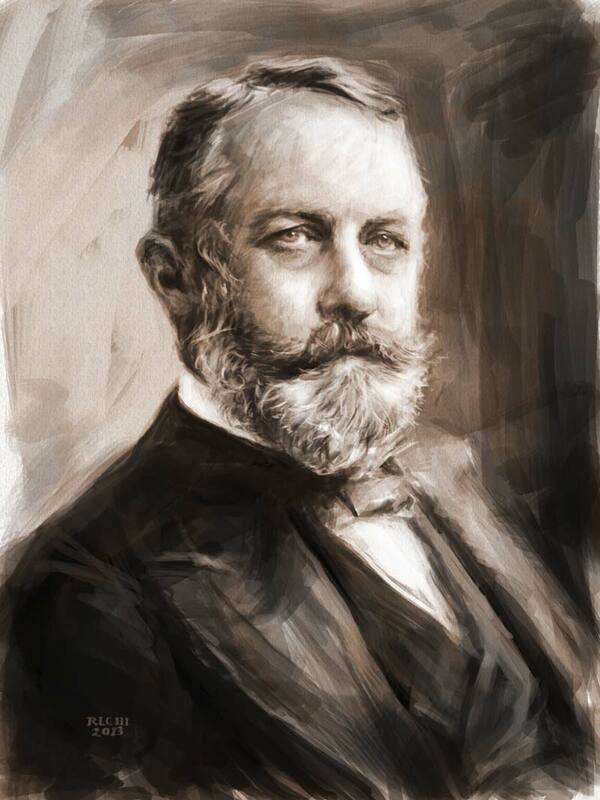 My digital sketch of American tycoon Henry Clay Frick. Character inspiration for the new painting series. Photoshop CS6. Check out the project at patreon.com and become a patron!